Many people feel that the hardest thing about saving money is actually saving it one cent at a time. Some also feel it is difficult to save money with their income or are completely ignorant in safeguarding their financial goals. No matter how you fare in your financial journey, you need to know that you can start saving whenever you want. The first step in the right direction is crucial to get things going and the first step always the toughest. Not one tactic can be life-changing on the financial front but will surely result in a major difference over time especially if you manage to save time and money with regular effort. 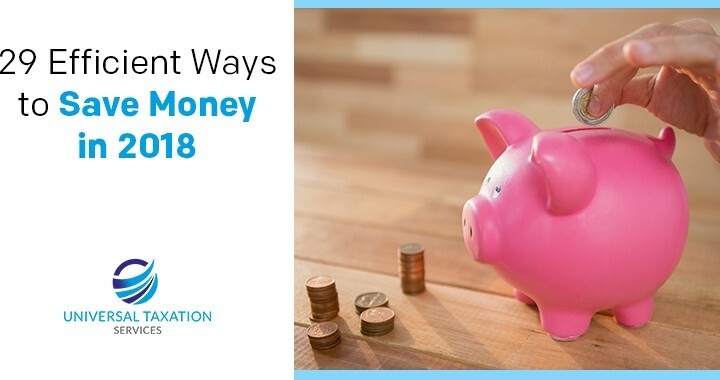 Here are 29 tips that are applicable to everyone who wants to save money in 2018. There might be some that are not applicable to you in any way. Apply at least 10 to 15 ideas and you will see that you are saving more money that it was previously not possible for you. Lodge tax returns every year even if you do not come under the taxable limit prescribed by the ATO. The tax return filings will help you maintain a good credit score. Take help from a reputed taxation service provider like Universal Taxation for saving on taxes too. Sign up for a site like Ebates that lets people earn free cash back to people who spend online. You just have to shop through tons of stores and shop normally. Ebates and similar such sites get prompt commissions for referring people to the store and in return, they offer the money back as gratitude. No matter where you live in Australia, you will get many retailers who reward you for shopping. Collect discounts through coupon apps before going to shop physically or online. Redeem cashback and reap other benefits too. Plan and prepare meal plans based on what is required and also on what is on discounts. Your meal plan can help you allocate money for something you might need other than meals. Create a concise list before going to the grocery store so that you buy items that fit in with the meal plans, and stop you from splurging on food that you might waste. Stick to the list for all kinds of grocery shopping. Grocery stores offer a variety of loyalty cards that are used for additional savings. Do not skip on loyalty cards just because you have too many extra cards in your wallet. You can even download apps like Key Ring that carries your loyalty cards together without having to carry physical cards. Meat is quite expensive compared to vegetables and fruits. So if you can try cooking vegetarian food based on interesting vegetarian recipes, you could skip on meat at least once or twice every week and thus reduce expenses. Every car needs proper maintenance. Keep checking your tires and get your car oil changed from time to time. Also get your engine tuned up in intervals. The maintenance of your car can reduce surprising repairs and costs. Sharing a ride can not only get you out of the hassle of driving your car in traffic but also helps in cut unnecessary expenditure. You can commute to the office with your co-workers living in your vicinity through sites like eRideShare. Taking the bus or even a subway train to work, can lower your gas consumption and reduce your car costs while lowering your insurance premium. You can even become an Uber driver and give rides to people so that you can earn few extra bucks while driving around to places you need to go. Simply renew car insurance each year by getting the best rates out there using sites like GoCompare. Compare all the rates from different insurers and you might save on several hundred dollars each year. If your gasoline expenses are out of control, use a cash back credit card to get cash back when filling up at the pump. Check out the best credit cards for racking up miles with regular purchases, and get adequate rewards too. Compact fluorescents beat incandescent light bulbs in terms of longevity and use a fraction of electricity compared to the light bulbs, thus reducing your energy bill. You can invest in LED bulbs too since they are more energy efficient than CFLs and last longer than them. Whether you have a room that is going unused or the garage is empty, you can let someone pay rent for the same and you get to earn money. Monitor your use of cable and internet over a month and then decide whether you want it or reduce it. Close down premium channels that you don’t watch. Check out the best internet plans and if the high speed is required for your regular purposes. Use home remedies to prevent regular ailments like a cough, cold, nausea and the like. For example, honey can soothe a cough, and ginger works well for nausea. Some home remedies are way better than the over-the-counter pills or medicines from a pharmacy. Get a life insurance plan that covers final expenses and check with top life insurance carriers for getting an affordable rate. Get quotes from InsureNow365 if you are older and in bad condition healthwise to find affordable rates. Package the leftovers for next day’s lunch instead of just keeping it in the fridge. It is cheaper than buying every day’s lunch.Put together some lunch items rather than grabbing fast food. A fruit or a granola bar can get you covered. Save money on gifts and make new homemade gifts with make food mixes, candles, bread or cookies, and other inexpensive items. Get a personal touch on gifts and stop splurging money on expensive ones especially during festivals or birthdays. Just buying cheap products to save on money would result in costly choices too. These products would not work for a long time and you might have to invest sooner than you think on another batch of products. Buy reasonably priced products and things. Refinance your mortgage to avail a lower interest rate to save several dollars each month. Check out how you can maximize savings, boost your credit score and also do not take up more debt. Check out how mortgage refinances can save lots of money. Do not stick to savings accounts that pay you lesser interest. You can switch accounts with another bank that is efficient in handling your money and also pays you more for fixed returns as well as savings. Check this in regard to investments you want to make too. You might have several unused items and gadgets lying around in your house. Take time to regularly sell unnecessary items on eBay or Craigslist so that you earn some extra cash from things you do not use in the first place. Weekend parties are a costly affair. Reduce any expenses on weekend parties other than those that are absolutely required to celebrate momentous occasions. Splurging on weekend parties can reduce groceries and stock to a huge extent and hence can be done away with. Don’t toss out clothes just because they are torn or have broken buttons. You can sew and stitch them up with closely-matched threads. Similarly you can use patches of some sort to save torn pants and use them for wearing around the house. Allocate a finite entertainment budget for every month, reserved for children and family. Go to movies, or a trip or a dinner based on the budget but do not exceed it. If you’re paying huge interest on credit cards, then use the spending power to make your payments at reasonable rates. You can negotiate your current interest rates with the issuer, and also the right to transfer a balance to another credit card as well. Quit your smoking habit completely. With the habit, you stand to lose a lot of money on a regular basis especially if you are smoking 2-3 cigarettes every day. By quitting the habit, you save on money and also preserve your own well-being for a long time. Turn off lights when not in use and incorporate solar lighting and heating in your house. That will help in reducing energy expenses in the house as well as contribute to a green environment. Each of the above tips will help a great deal in saving money in 2018. Comment and let us know if you have any more ideas on saving money efficiently. First Floor U5/12 Burton St CANNINGTON WA 6107. We are a team of young professionals committed towards getting the best possible Tax Solutions for our clients. We assist our clients in their own needs by adopting the most effective tax strategies. Our Goal is to understand your requirements and assist you in all the possible ways.